The best way to experience Samford University is to visit. Schedule a visit or take a virtual tour. 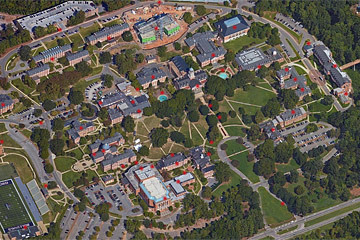 Samford University's 180-acre campus is located in Homewood, Alabama, a close suburb to Birmingham, the state's largest city. With more than 50 Georgian Colonial buildings, our campus is often called one of the most beautiful in America. The best way to understand the Samford experience is to visit our campus! McWhorter School of Pharmacy is housed within Samford's College of Health Sciences, located on the east side of campus. The College of Health Sciences facilities span more than 223,000 square feet of space across two buildings. Samford dedicted the facilities in fall 2016 to house the School of Health Professions, Ida Moffett School of Nursing and School of Public Health, along with the pharmacy school, providing students and faculty the opportunity to learn and work in an interprofessional environment.